There was a moment when I was playing Arms (not ARMS: come on, people) where I was suddenly hit with a flashback of something I’d experienced nearly a decade before. It was when I performed a grab move in the game, flinging both my extendable arms at my opponent and pulling them towards me for a beat down. So I did. And as I did, I suddenly found myself at the Wii post-E3 event in 2007 again, trying out Mario & Sonic At The Olympic Games for the first time. So I did. And I convinced myself then that it was a fad and ‘waggling’ wasn’t going to be a popular control method for too long. We meet again, Old Scratch. 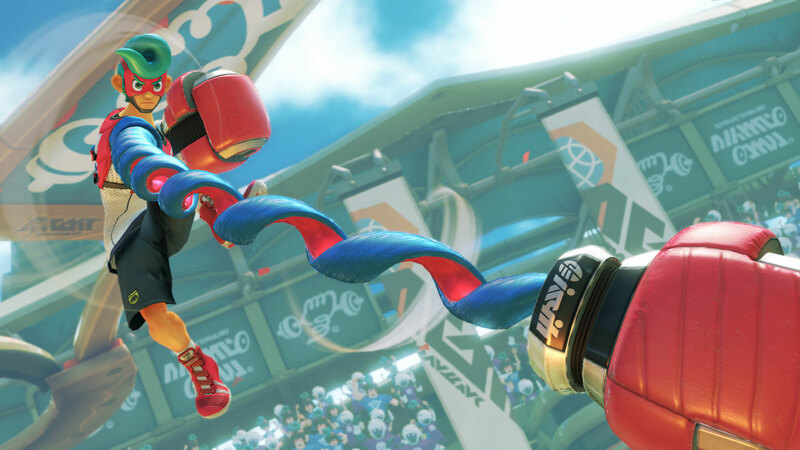 Don’t worry, though: there’s thankfully more to Arms than the unwelcome return of the dreaded w-word that Wii detractors took great pleasure in attributing to any type of motion control (whether it deserved it or not). The rest of the game is an interesting little fighter that reminds me a bit of classic Sega robot scrapping sim Virtual On. Well, if all the robots were replaced with Dhalsim from Street Fighter II. 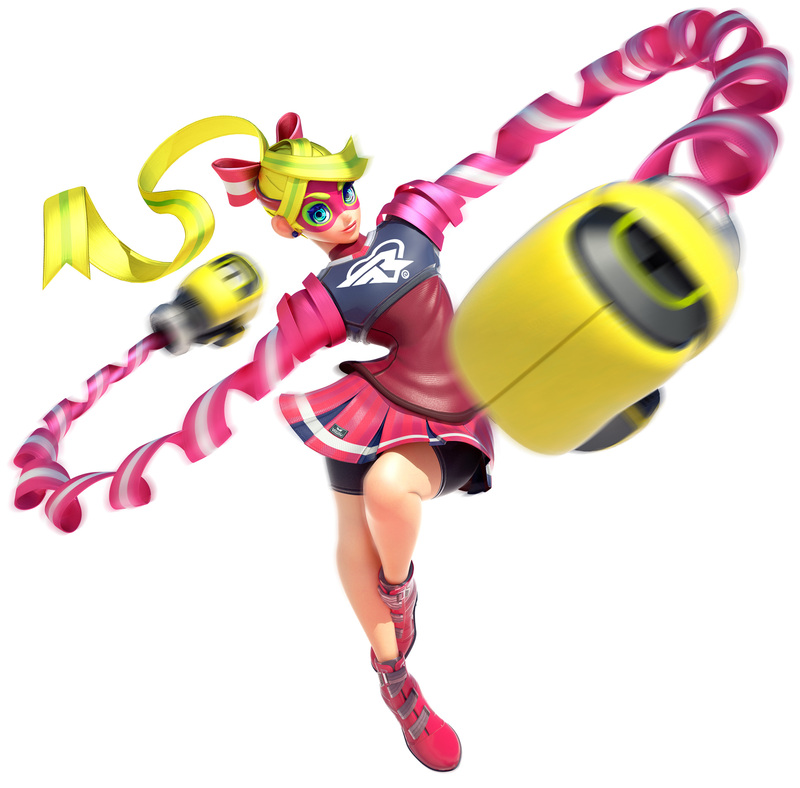 For those not aware of it yet, Arms is a one-on-one fighting game in which each of the characters has large extendable arms. Think Stretch Armstrong in a bad mood. By making a punching motion with either the left or right Joy-Con controller, your character will throw a long punch (a really long one) with their respective extendable extremity. 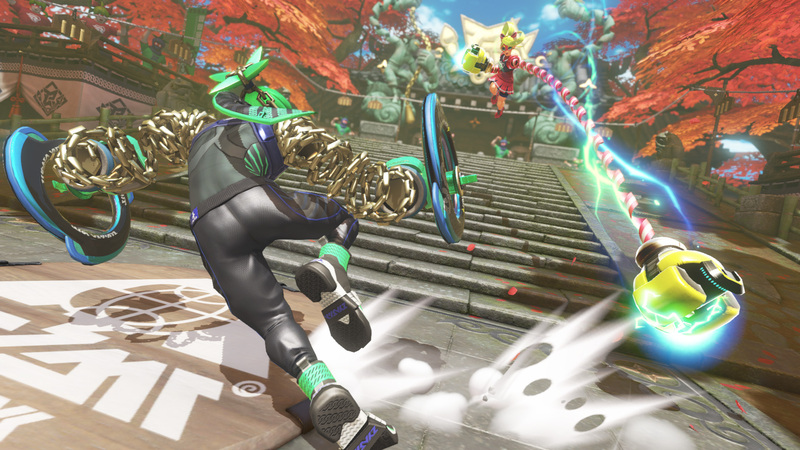 On paper it sounds like a gimmicky recreation of the boxing game in Wii Sports, but there are some other control mechanics in there to keep things more varied. Your offensive arsenal is enhanced with swerving punches. By twisting your wrist after throwing a punch you can bend your arm so it follows your opponent if they try to get out of the way. Defensively you’ve got a few options available to you too. Dash and jump buttons give you a fighting chance of evading attacks while at the same time putting you in a good position to retaliate with a protractible pummelling of your own. With practice you can pull off some advanced techniques, such as punching your foe’s fists out of the air or using a last-minute block to stun their arm and leave them open for attack. There’s a half-decent level of strategy here, then (even if it isn’t quite Street Fighter III: Third Strike), and the five characters available in the demo I played do an adequate job of covering the usual fighting game tropes you’d expect. There’s your generic Ryu and Ken style all-rounders (Spring Man and Ribbon Girl), your quick but weak ninja type (Ninjara) and your slow but big and powerful chap (Master Mummy). 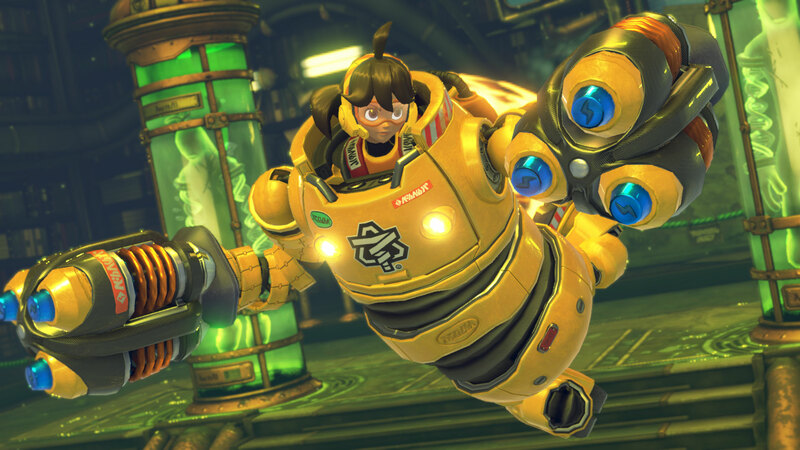 And then of course there’s Mechanica, your token young girl in a mech. 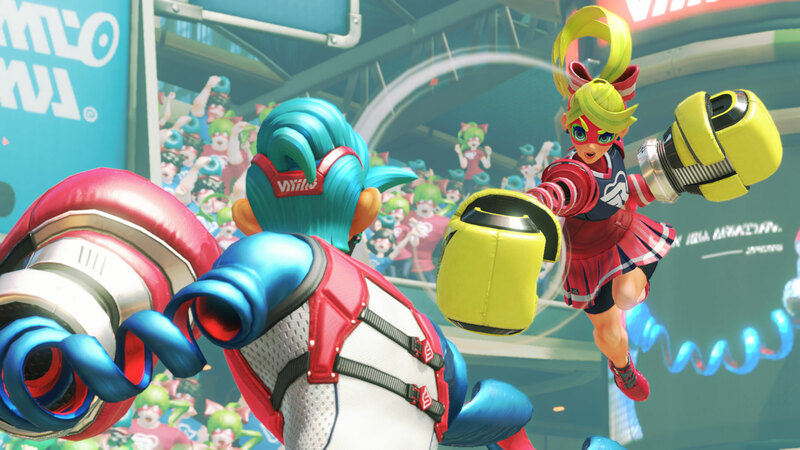 Running around flinging punches at pricks has the potential to get a bit samey after a while, so Arms also attempts to mix things up a bit with its stage design. As well as the standard square arena there are slightly less conventional levels that will require a tweak to your fighting style. Take the stage in front of the Asian temple, for example, in which the fight takes place on an enormous stone stairway. The uneven surface and the potential to take higher ground makes things a little more interesting. Similarly, the level set in a lab with giant glass columns you can hide behind puts a greater emphasis on curved punches. 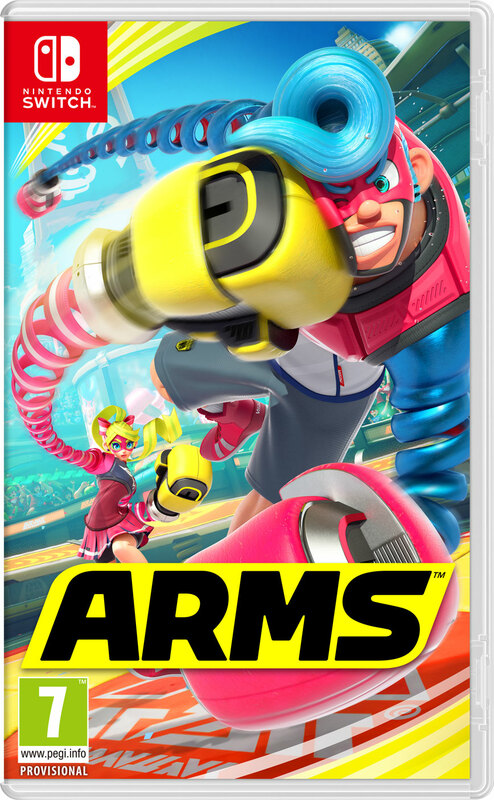 Despite all the above, I’m not completely sold on Arms yet, for a number of reasons. Most notable of these is the motion controls. No, I’m not going to go on an old-school “wah, motion controls are ruining gaming rant”, because after six years at ONM playing plenty of excellent motion-controlled games on Wii I’m not that shallow. 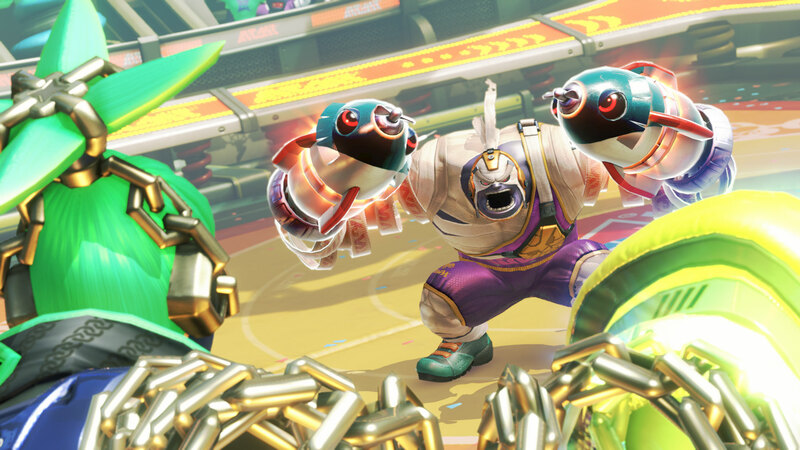 Instead, my concern is that since playing Arms properly requires players to use both Joy-Con controllers, local multiplayer matches – which are clearly going to be this game’s highlight – will need another two, either from a second Switch console or bought separately for a wallet-wincing £69.99. It’s been confirmed that you can play the game with ‘traditional’ controls instead of motion, which would theoretically mean two players being able to use a single Joy-Con each. But will playing like this make the game less fun? This remains to be seen. As does the actual volume of content we’re going to get in Arms when the final game launches in (appropriately enough) Spring. Nintendo’s already stated there’ll be more than the five characters featured in the demo, which is just as well because there’s nowhere near a £50 game in there yet. Before I fork over my cash for it I’m going to want to see a lot more characters, plenty more stages (each with a unique gimmick, preferably) and a solid single-player mode that goes beyond arcade-style ‘beat this fighter, then this one, and so on’ stuff. I like what I’ve seen so far, but I remain unconvinced at this point. It’s going to take a little more than this to disarm me. You’d think I’d be sorry for that joke. You’d be wrong. My Switch coverage continues later this week with hands-on articles for Snipperclips, Super Bomberman R and Ultra Street Fighter II. If you want to support my work, please do consider pledging to my Patreon. I know everyone’s got one these days but hey, I was doing it first. I mean, I wasn’t. Far from it. But nobody needs to know that. Next Post: TOH Podcast 4 – Resident A-holes? As for the game itself, it was one of the few games shown during the presentation to catch my interest. I do agree with you about more characters, stages and such (which I have no doubt will appear in the final game), but I am intruiged with this one. This game was really the surprise of the event for me, and honestly I feel it was the standout. And with the way they were pushing it it should have been – I’m pretty sure they had the same number of consoles there running Arms as they did Zelda. I’m not quite sold on the claim of it’s massive scope for strategic fighting though. The way me and my mate were playing it was much more like Wii Sports boxing than pro Street Fighter, but just the fact it’s got SOME levels of strategy in there makes each win feel earned. The game using motion controls gives you some bonus endorphins on top of that. Though it’d be quite possible for the developers to sustain what depth there is on a Pro controller, on a single Joy-Con I think it would be a real achievement. The best way to play would certainly be two Joy-Cons each and the perception and therefore the success of the game will definitely be affected the prices of those things going forward. 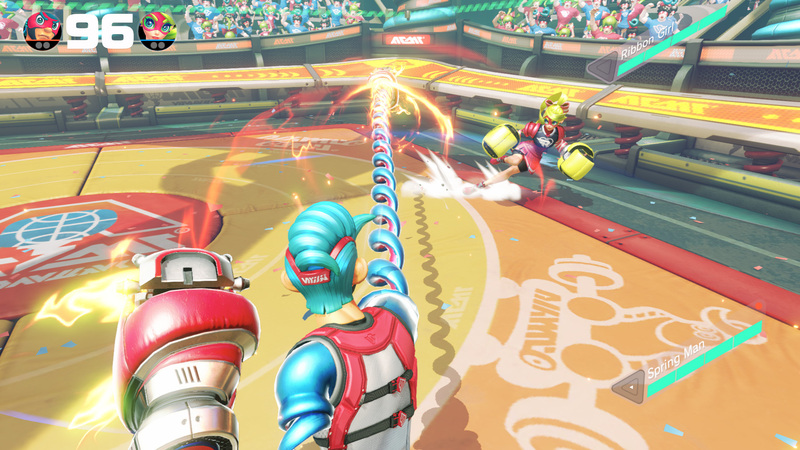 Wii Sports had the benefit of being free; local multiplayer on Arms looks like it’ll cost upwards of £100. My mate and I really got the feeling Nintendo was going for more of an eSports vibe on this one, though it will 100% never catch on that way, but with the Switch supporting gameplay video sharing at the very least the online community for this will be entertaining to watch. Great post. I liked your preview of the game. I really want to support Nintendo on this one, but so far I haven’t been completely sold on the idea. I’d love it I could download a demo of the game and try it out myself once I pick my Switch up.